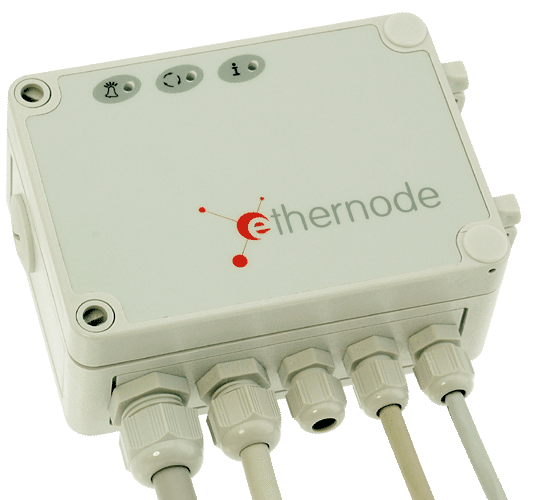 ethernode® ETH-A7-3A4IO is a full featured control unit at the Ethernet. It offers three high-precision analog inputs for PT100, thermocouples or 4..20mA process current, in addition 4 digital inputs and 4 P-switching 24V outputs, two serial interfaces and optionally an LCD. Standard-ethernode A7 with 1x RS232, 1x RS232/485, 3 analog inputs switchable between Pt100 RTD or thermocouple (as a group), 4 digital inputs 24V, 4 protected 24V/1A power outputs. Standard-ethernode A7 with 1x RS232, 1x RS232/485, 3 analog inputs 0..20 or 4..20mA, 4 digital inputs 24V, 4 protected 24V/1A power outputs. ethernode A7L with graphic LCD and membrane keyboard. 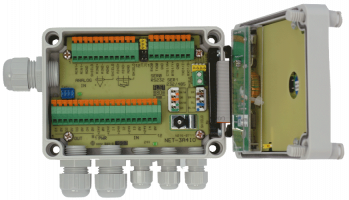 I/O: 1x RS232, 1x RS232/485, 3 analog inputs switchable between Pt100 RTD or thermocouple (as a group), 4 digital inputs 24V, 4 protected 24V/1A power outputs. ethernode A7L with graphic LCD and membrane keyboard. I/O: 1x RS232, 1x RS232/485, 3 analog inputs 0..20 or 4..20mA, 4 digital inputs 24V, 4 protected 24V/1A power outputs. It is hard enough to get a Pt100 reasonably accurate into the Ethernet, but this small box does more: The precision of the 3 analog inputs is sufficient for real measuring, the internal buffered memory allows data logging and in the display version (A7L) you can even show a rough x/t or bar graph. Even more: With the digital outputs stand-alone two-step controls can be implemented, the beeper acoustically signals excess temperatures while an e-mail over the server activates an SMS. You also could assign data to a code read from a bar-code-reader on the RS232 line or read some scales over RS485. The 3A4IO gets fed either from the external 24V power supply or - with the PoE option - through the Ethernet cable from the PoE switch. ETH-A7L-3A4IO is indeed usable for nearly everything and it can - if necessary - be extended over the I2C bus e.g. with ETH-4I4RHV. 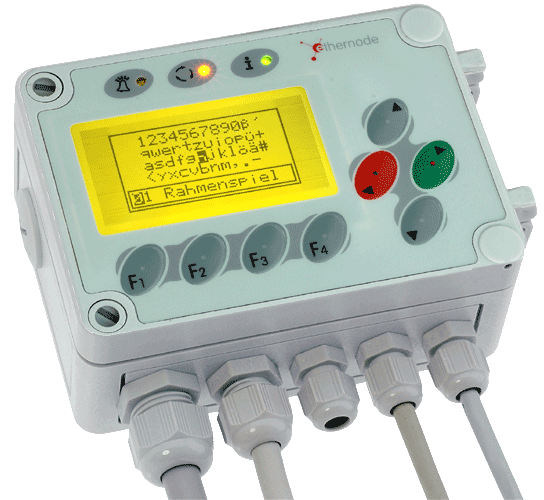 This data logging controller with integrated terminal is as well suitable for a small machine, a cold store or a flight of locks connected through WLAN while measuring the pH-value of the nearby fishpond. We are curious to hear what you are going to control with it! ETH-A7x-3A4IO has got 3 analog inputs, 4 digital 24Voptocoupler- outputs and 4 p-switching 24V outputs. The digital I/ Os are described more in detail at the ETH-A7-4IO, which is a partial assembly of the 3A4IO. The strengths of the analog inputs are well-founded in the 16-Bit-Delta-Sigma-ADCs: Δ-Σ-ADCs have got an intrinsic input filtering that is very important in a harsh industrial environment. So it is usually not necessary to calculate the average of several measurements in order to compensate troubles. 3A4IO is easy programmable in C thanks to it's all around support from mCAT, but also over web-interface many activities are already possible. If e.g. an analyser or a scale have to be get their raw data preprocessed such that possibly several users can work on them in parallel, you have to use local programming on ethernode. In comparison to other Ethernet-to-RS232 converters ethernode® performs here very well because the mCAT firmware offers comfortable support for such a small unit: Over the 3 separate webservers you can display e.g. the current values and statistic data for the general public while you can control the unit's functions over the input fields an buttons on a protected port. The live data access to inputs or your user task's variables is easily set up by introducing "mSP - mCAT Server Pages" tags into standard HTML pages (see Webserver). If you wish a stand-alone function of ETH-A7-3A4IO, you have to program your application task in C and to load it with the aid of the mCAT monitor SYSMON at first into the RAM and later on into the flash on the ethernode-A7-CPU. Process in- and outputs of mCat are available with convenient I/O functions with in(...) and out(...) macros, the so-called Express-I/O. If you want to communicate with other tasks, send and receive messages e.g. of SerDrv for serial periphery. The Ethernet communication usually runs over the Socket-Interface.